How Important Is The Timing Of "When" You See An Astrologer? The issue of timing invariably arises when the topic of astrology is discussed. The question is often asked, "Is there an auspicious time for setting up an astrological consultation?" How Important Is The Timing Of "When" You See An Astrologer? A person may internally sense that what is unfolding in their life doesn't necessarily correspond to the experiences of others around them. They ask themselves: "Am I the only person who can't make sense of what I'm feeling and experiencing?" The meaning and value of these experiences or events invariably have a subjective quality of which the timing must be honored if we are going to keep moving in a positive direction. People seek guidance in order to make responsible decisions when no rational reasons can be found for moving in one direction or another. As we navigate life's ever changing landscape the need for concrete dialog at these critical times cannot be over emphasized. At Seattle Astrology, a key aspect of an astrological reading is understanding your situation from the perspective of "individual time." The term individual time is referring to subjective timing, which points to the need to understand life from a feeling of being whole, unique, and self-sufficient. A discussion of individual time also calls attention to what is referred to as generic (objective, or clock ) time. Generic time is often in contrast to individual time. As a person reaches a need to understand themselves better, a natural crisis between generic time and individual time often results, as these two separate senses of time collide. This collision between the internal and external worlds is often immediate and crucial. Astrology incorporates the use of individual and generic time. In the sense of using astronomical data, astrology looks at generic time as it is seen through the movement of celestial cycles. However, astrology isn't merely a study of celestial cycles in themselves; it's a technique of interpreting the meaning of these cycles with reference to the possibilities for personal growth within the individual. There is an expansive aspect to these great cycles where individual time dominates and feels quite compelling. The greater the awareness of individual time, the greater the opportunity of restructuring time so that the sense of time brings a creative freedom of subjective duration. Hence, the discovery of one's own individual time supports the individual's own structure of being. One of the more important astrological dynamics to consider is what has been referred to as the "Cross of Destiny" or the "Cross of Dharma." Every person needs to know not only what their potential is, but where their destiny lies, if their full potential is to be actualized. Dharma is said to be a person's most significant life's work. In other words, a person's essential essence and radiance, combined with their purpose and spiritual evolution, results in an individual's dharma and life's work. Each person enters this life with a certain amount of unfinished business (karma) of past cycles. This life becomes an opportunity to transform one's karma into dharma. The Cross of Dharma points to the path of transforming your personal essence from potential into fulfillment. Fulfillment and self-actualization is through the transformation of consciousness. The cross of dharma clearly unveils how this transformation of consciousness blossoms within the context of your life experiences. It becomes a valuable tool in knowing how to meet the challenges you constantly face. It also reveals the well-spring and source of your individual power. It shows how your use of power fulfills a need within the world that can only be filled be by you. The answer to "Why is this my destiny?" is finally clear and a deeply needed frame of reference is established which allows for personal growth to take place within a deeper level of significance. Life feels richer and fuller when an understanding of your life's purpose takes on a new and deeper meaning. 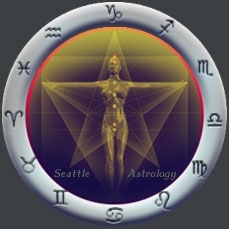 The Cross of Dharma is only one aspect of an astrological consultation at Seattle Astrolgy. Sabian astrology, combined with Rudhyarian astrology, is now in the process of moving into the world forefront as a new symbolic astrology based on powerful archetypical images that, until recently, were only found hidden within past mysitical traditions. Sabian astrology enables us to look at a natal horoscope with a remarkable depth not possible before. As the world and humanity move toward a greater sense of globalization of consciousness, the need for compartmentalizing astrological systems into eastern and western types of astrology is becoming obsolete. Symbolism that was formally Vedic or westernized is being replaced with universal archetypes that transcend culture and religious-specific traditions. It is amazing how Sabian and Rudhyarian astrology bridge the gap between eastern and western approaches to spiritual evolution. Why is Sabian Astrology a Holistic Approach? The entire solar system is considered, and seen, as a whole system in Sabian astrology. The solar system functions as a whole and the individual person is a reflection of this Whole system. Traditional astrology divides life experiences into twelve categories. Sabian astrology has the new ability to divide these experiences into 360 separate phases, all reflecting a centralizing and harmonizing aspect of an entire cycle of existence. There are also Sabian themes that represent 72 cycles of transformation, adding a new depth to astrology that has not been previously accessible. It's extremely exciting to access new information about planetary integration, using techniques and skills which have not been available within any form of astrology until now. With Sabian astrology, the meaning of the Zodiac now reflects a deeper and transcendental aspect that is directly useful for personal growth. Rather than being constellation based, the Zodiac is symbolically read as an aura, or energy field. This is becoming evident among progressive astrologers, now that science has confirmed what esoterics have long suspected, concerning the solar tide (and its ebb and flow) that exists throughout the solar system as a result of the 11 year solar flare cycles. Sabian astrology will help you understand yourself better. This is an understanding born of knowing your place in the world. There is also a natural security that rises from knowing, not what "exactly" will happen, but what your best strategy is in meeting what will come. As you understand what phase of growth you are currently experiencing, what your sense of relatedness is, and your connection to the greater whole in which you have your Being, your sense of purpose will give a deeper meaning and significance to every experience.